High in the Sonoran Desert lies one of the Valley’s finest golf facilities: Troon North Golf Club. Troon North provides the perfect golf outing for any player looking to experience a quiet and pristine round at two of Scottsdale’s most notable public courses. Troon North is conveniently located two miles from the Four Seasons Resort Scottsdale, which provides luxury hospitality and offers ideal views of the surrounding foothills. For nearly 20 years, Troon North has been recognized for having two of the greatest desert courses around: the Monument and the Pinnacle. The Monument course, created in 1990 by Tom Weiskopf and Jay Morrish, tests a player’s accuracy. The course snakes through natural washes, steep arroyos and lush vegetation, all while boasting mountain views and surrounding cacti. 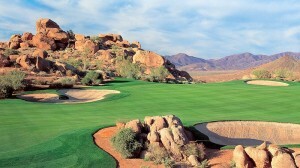 Although the majority of the fairways are wide, an errant long shot will certainly put a player’s ball in the desert. The equally dramatic Pinnacle features more options off the tee, but is heavily bunkered with tiered greens and elevation changes. The course was designed solely by Tom Weiskopf in 1996 to extend playability options. The Pinnacle stretches a player’s knowledge due to the dramatic slopes from the nearby rocky foothills. In 2007, both courses were rerouted to improve playability. The old front nines from both courses now make up the new Monument course and the old back nines make up the new Pinnacle. “Both courses can now be played exactly as the land dictates, the way Mother Nature intended,” Tom Weiskopf, the original and renovator designer said. Some additional changes were also made to the bunkers and greens. The bunkers were strategically placed to blend the formally distant nines, and the greens were reseeded with Penlinks Bent grass, which has given the facility a huge advantage. Bent grass can survive the Northern Scottsdale cooler climate, which means Troon does not have to overseed between seasons. This allows for consistency and more predictable rolls. The course renovations give a completely different feel for people who played the original design, according to Mike Friend, Director of Golf Events. 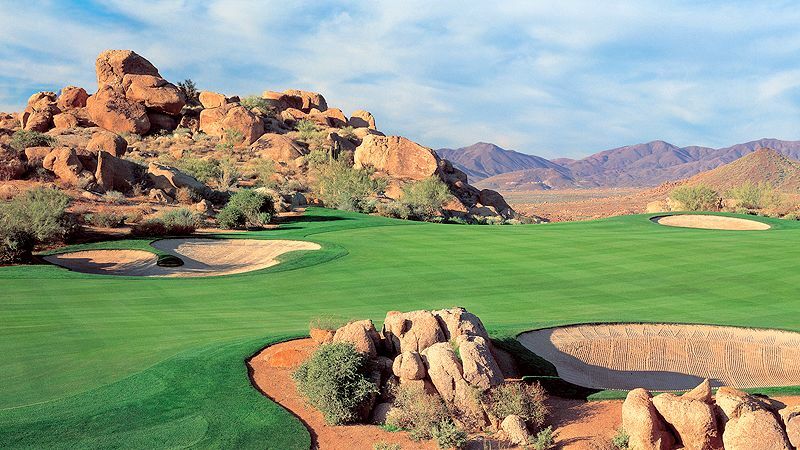 The course redesign also increased the Pinnacle’s playability because many players consider it to be the harder of the two courses. Others think the Monument remains the more dramatic course, offering spectacular views and several drivable par-4s. Two of the Monument’s most notable holes are numbers six and fifteen. The short par-4 number six, also known as Gamble, is a perfect example of how taking a risk can be rewarded. Many long-hitters can reach the green in one, setting up a perfect eagle opportunity. Number fifteen, another short par-4, is a player favorite due to its scenic surroundings. Precise accuracy is a must in order to put the ball far in the fairway or on the narrow green. A recently added executive course was combined with the Monument’s front nine called the Monument Express. The course was built to encourage young players and people of all skill levels to come out and try golf. The 1,578-yard course provides two different par options depending on the player’s experience. The Monument Express opens every day after 3:30 pm and players 15 and under get to play free with a paying adult. In addition, Troon North also offers one of the only public forecaddie programs in the state. For a small fee, forecaddies can provide players with strategies for each golf hole, locate errant shots, assist with putts and much more. After an enjoyable round on the fantastic course, players can experience Troon’s 37,000-square-foot clubhouse, which offers a variety of services. Players can enjoy a variety of food and beverages at the Dynamite Grille, which overlooks Pinnacle’s 18th green, or shop in one of America’s top 100 ranked golf shops by Golf World Magazine. The golf shop provides a wide range of name brand apparel, gifts, and golf accessories. Whether you are a vacationer, businessman or avid golfer, Troon North’s friendly staff will accommodate to your own individual needs. They have a state of the art Callaway club fitting and designing room, golf lessons, and private meeting rooms that overlook the Sonoran Desert. Tee time availabilities and rates can be found on their website at www.troonnorthgolf.com, or can be booked by calling. All rates include green fees, cart fees, personalized cart headers and scorecards, yardage guides, pin sheets, a bag tag and range balls. Troon North is one of my favorite designs in Scottsdale. I played Monument back in January and it was one of my favorite rounds I have played in years. Great course.